Easy digital downloads (EDD) has a few shortcodes, that you can use, to display the purchase buttons or prices for whichever product you want on whichever page you want. Let’s look at these shortcodes and how to use them. Shortcode: [purchase_link] – EDD documentation for purchase_link shortcode. EDD has a shortcode to display the purchase link/button of any product (or even product variations/variable pricing product), called purchase_link. direct – whether the purchase button should send the customer straight to the FastSpring checkout or to the EDD checkout page. How to get the download/product ID? As you can see, this shortcode is very versatile. Choose the attributes you need and create your own shortcode. Shortcode: [edd_price] – EDD documentation for edd_price shortcode. 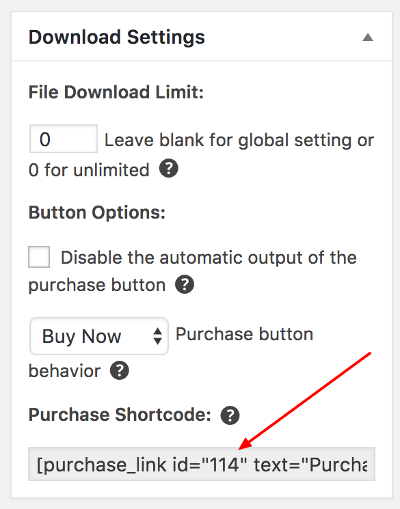 If you want to display an accurate price (FastSpring adds taxes to the price if applicable and converts to the client local currency) for your users, then you can do so with edd_price shortcode.